This name uses Portuguese naming customs. The first or maternal family name is de Jesus and the second or paternal family name is Marto. Saint Francisco de Jesus Marto (11 June 1908 – 4 April 1919), his sister Saint Jacinta de Jesus Marto (11 March 1910 – 20 February 1920) and their cousin Lúcia dos Santos (1907–2005) were children from Aljustrel, a small hamlet near Fátima, Portugal, who witnessed three apparitions of the Angel of Peace in 1916 and several apparitions of the Blessed Virgin Mary at Cova da Iria in 1917. The title Our Lady of Fátima was given to the Virgin Mary as a result, and the Sanctuary of Fátima became a major centre of world Christian pilgrimage. The two were solemnly canonized by Pope Francis at the Sanctuary of Our Lady of Fátima, in Portugal on 13 May 2017, the first centennial of the first Apparition of Our Lady of Fátima. According to the memoirs of their cousin Sister Lúcia, Francisco had a placid disposition, was somewhat musically inclined, and liked to be by himself to think. Jacinta was affectionate with a sweet singing voice and a gift for dancing. Following their experiences, their fundamental personalities remained the same. Francisco preferred to pray alone, saying that this would "console Jesus for the sins of the world". Jacinta said she was deeply affected by a terrifying vision of Hell shown to the children at the third apparition, and deeply convinced of the need to save sinners through penance and sacrifice as the Virgin had told the children to do. All three children, but particularly Francisco and Jacinta, practised stringent self-mortifications to this end. The Congregation for the Causes of Saints, in the report that confirmed Jacinta as beatified, observed that she seemed to have "an insatiable hunger for immolation." The brother and sister, who tended to their families’ sheep with their cousin Lúcia in the fields of Fátima, Portugal, are said to have witnessed several apparitions of an angel in 1916. Lúcia later recorded the words of several prayers she said they learned from this angel. Sister Lúcia wrote in her memoirs that she and her cousins saw the first apparition of Mary on 13 May 1917. 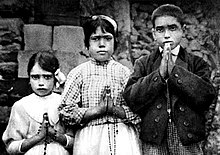 At the time of the apparition, Francisco was 8 years old, and Jacinta was 7. During the first apparition, Mary is said to have asked the three children to say the Rosary and to make sacrifices, offering them for the conversion of sinners. She also asked them to return to that spot on the thirteenth of each month for the next six months. The siblings were victims of the great 1918 influenza epidemic that swept through Europe that year. In October 1918, Jacinta told Lucia that Mary had appeared to her and promised to take them to heaven soon. Both lingered for many months, insisting on walking to church to make Eucharistic devotions and prostrating themselves to pray for hours, kneeling with their heads on the ground as they said the angel had instructed them to do. Francisco declined hospital treatment on 3 April 1919, and died at home the next day. Jacinta was moved from one hospital to another in an attempt to save her life, which she insisted was futile. She developed purulent pleurisy and endured an operation in which two of her ribs were removed. Because of the condition of her heart, she could not be fully anesthetized, and suffered terrible pain, which she said would help to convert many sinners. On 19 February 1920, Jacinta asked the hospital chaplain who heard her confession to bring her Holy Communion and administer Extreme Unction because she was going to die "the next night". He told her that her condition was not that serious and that he would return the next day. The next day Jacinta was dead; she had died, as she had often said she would, alone. When you are to say this, don't go and hide. Tell everybody that God grants us graces through the Immaculate Heart of Mary; that people are to ask her for them; and that the Heart of Jesus wants the Immaculate Heart of Mary to be venerated at his side. Tell them also to pray to the Immaculate Heart of Mary for peace, since God entrusted it to her. Jacinta and Francisco are both buried at the Basilica of Our Lady of the Rosary of Fátima. The cause for the siblings' canonization began in 1946. Exhumed in 1935, Jacinta's face was found incorrupt; Francisco's had decomposed. 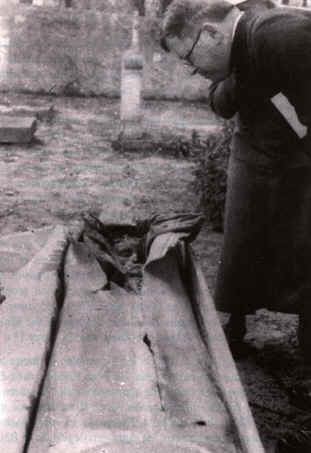 By 1951, when she was again exhumed for her reburial in the Basilica, Jacinta had begun to decompose also. In 1937 Pope Pius XI decided that causes for minors should not be accepted as they could not fully understand heroic virtue or practice it repeatedly, both of which are essential for canonization. For the next four decades, no sainthood processes for children were pursued. In 1979 the bishop of Leiria-Fátima asked all the world's bishops to write to the Pope, petitioning him to make an exception for Francisco, who had died at age 10, and Jacinta, who had died at age 9. More than 300 bishops sent letters to the Pope, writing that “the children were known, admired and attracted people to the way of sanctity. Favors were received through their intercession.” The bishops also said that the children's canonization was a pastoral necessity for the children and teenagers of the day. In 1979 the Congregation for the Causes of Saints convened a general assembly. Cardinals, bishops, theologians and other experts debated whether it was possible for children to display heroic virtue. Eventually, they decided that, like the very few children who have a genius for music or mathematics, "in some supernatural way, some children could be spiritual prodigies." They were declared venerable by Pope John Paul II in 1989. On 13 May 2000, they were declared "blessed" in a decree from the Congregation for the Causes of Saints. Jacinta is the youngest non-martyred child ever to be beatified. In her biography of Jacinta Marto, Sister Lúcia said that Jacinta had told her of having had many personal visions outside of the Marian visitations; one involved a pope who prayed alone in a room while people outside shouted ugly things and threw rocks through the window. At another time, Jacinta said she saw a pope who had gathered a huge number of people together to pray to the Immaculate Heart of Mary. When Pope John Paul II arrived in Fátima for the first time, in 1982, he said that he had come "because, on this exact date last year in St. Peter's Square, in Rome, there was an attempt on the life of your Pope, which mysteriously coincided with the anniversary of the first vision at Fátima, that of 13 May 1917. The coincidence of these dates was so great that it seemed to be a special invitation for me to come here." Another miracle was found to have been attributed to their intercession and the process that investigated the presumed miracle was validated on 8 February 2013. On 23 March 2017, it was announced that Pope Francis would canonize them while visiting Portugal on 12 and 13 May. The pope solemnly canonized the children on 13 May 2017 during the centennial of the first apparition. They are the Catholic Church's youngest saints who did not die as martyrs, with Jacinta the youngest. ^ Article on Official Webpage: Shrime of Fatima, "Today marks the anniversary of Saint Jacinta Marto's birth." ^ a b Melton, J. Gordon (2008). "Fatima (Portugal)". The Encyclopedia of Religious Phenomena. Canton, Maine: Visible Ink Press. pp. 107–109. ISBN 1-57859-209-7. Retrieved 15 May 2017. ^ Sister Lúcia: Fatima in Lucia's Own Words, Memoir 2, p. 94, online, accessed 21 June 2011. ^ Congregation for the Causes of Saints Decree regarding the Canonization of the Servant of God Jacinta Marto. 13 May 1989. ^ a b c "Blessed Francisco and Jacinta Marto". ^ a b c "BLESSED FRANCISCO AND JACINTA MARTO :: Catholic News Agency (CNA)". 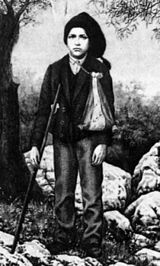 ^ A detailed account of the lives, illnesses and deaths of both children is given in de Marchi, John, The True Story of Fatima, 1950 edition, entire text on line, found 19 October 2007. ^ "On September 12, 1935, the mortal remains of Jacinta, who died in 1920, were exhumed. Her face was found to be incorrupt." Solimeo, Luiz. Fatima: A Message More Urgent Than Ever. (2008) pg. 97. "Today, the remnants of both Francisco and Jacinta rest at the Basilica of Fátima." pg. 99. ^ Alipio da Silva Vicente, "Exhumation of Jacinta". Photograph taken May 1, 1951. Source: University of Dayton Marian Library & Research Institute Photo Collection. ^ "Pope Francis will canonize two of the children who saw Our Lady of Fatima". 23 March 2017. ^ "The Latest: Pope ends Portugal visit, leaves for Rome". ^ "Pope canonizes children behind 'Three Secrets of Fatima'". ^ Minder, Raphael (13 May 2017). "In Portugal, Pope Proclaims Two Fátima Siblings Saints" – via NYTimes.com. ^ "Pope recognizes miracle attributed to Fatima visionaries". www.catholicnews.com. EWTN: The Children of Fátima: the Mother of God appeared six times to three little shepherds. Sister Lúcia wrote detailed accounts or "memoirs" of her cousins for their canonization process, later adding a detailed account of the Marian apparitions and information about her family. All memoirs are available for free online in English language as Fátima in Lúcia’s own words. This page is based on the Wikipedia article Francisco and Jacinta Marto; it is used under the Creative Commons Attribution-ShareAlike 3.0 Unported License (CC-BY-SA). You may redistribute it, verbatim or modified, providing that you comply with the terms of the CC-BY-SA.